Nancy Bray and I had been planning a trip to the North Umpqua for quite a while. I was rather torn between going to some of my favorite places in Douglas County and looking for more milkweed and monarch sites. As luck would have it, I was able to do both. While checking the distribution of purple milkweed (Asclepias cordifolia) on the Oregon Flora Project Atlas, I had noticed one record of milkweed on Medicine Creek Road 4775 in the North Umpqua area from 1994. While out with Crystal Shepherd on Monday, she told me she used to work at the Diamond Lake District and had seen the milkweed at that site just 5 years ago. 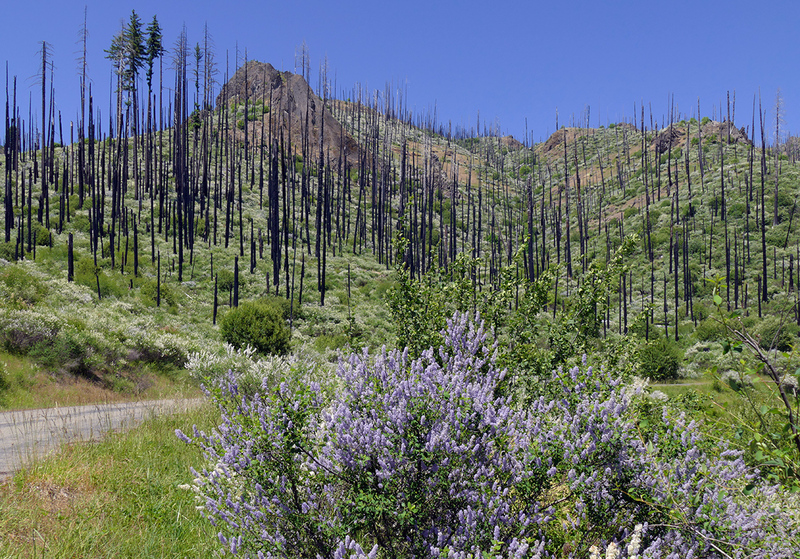 On Wednesday, June 28, I picked Nancy up, and we headed down to the North Umpqua and straight for Medicine Creek Road, just past the Soda Springs Reservoir. The USGS map shows the beginning of the road as paved, but when I called the ranger district office, I was told it wasn’t paved but was good gravel. So when we arrived, I was surprised and pleased to find the road actually was paved for at least 4 miles, right up into a very wild looking burned area. 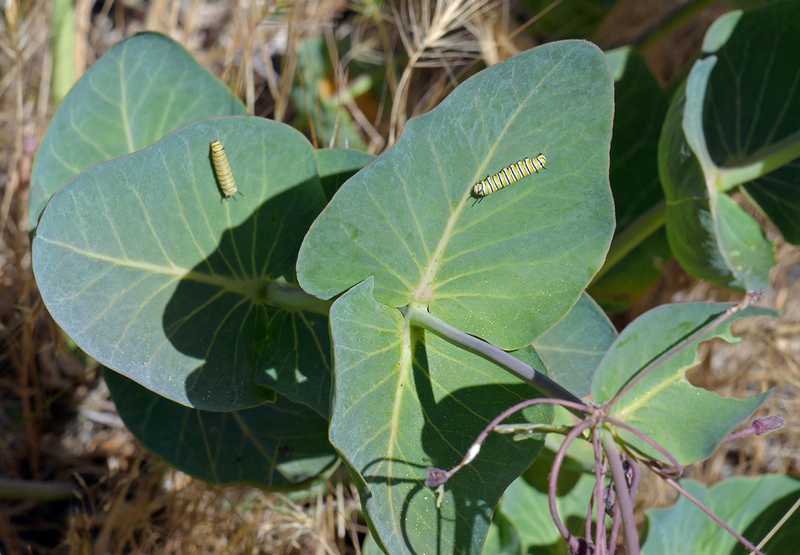 On the way up, we spotted the milkweed growing right along the road near the milepost 2 marker. This couldn’t be easier! Ceanothus species like this deerbrush can fix nitrogen in the soil and frequently colonize burned areas like this one along Medicine Creek Road. After admiring the acres of deerbrush (Ceanothus integerrimus) blooming in the burn and all the butterflies flying around the area, we drove back down to MP 2 and found a shady spot to park the car. At only about 2800′, it was fairly warm at this elevation, but there was a nice breeze to keep the mosquitoes away. There were butterflies everywhere, moving quickly in the warm air. Within a few minutes, Nancy had spotted the first monarch and I had found the first caterpillar—this was going to be a great day! A Lorquin’s admiral was among many species to be drawn to the heavenly scented mock-orange. While most of the caterpillars we saw were still pretty small, this one was probably in its last instar, almost ready for his big metamorphosis into a chrysalis! We spent about two and half hours just wandering along this quarter mile stretch of road. 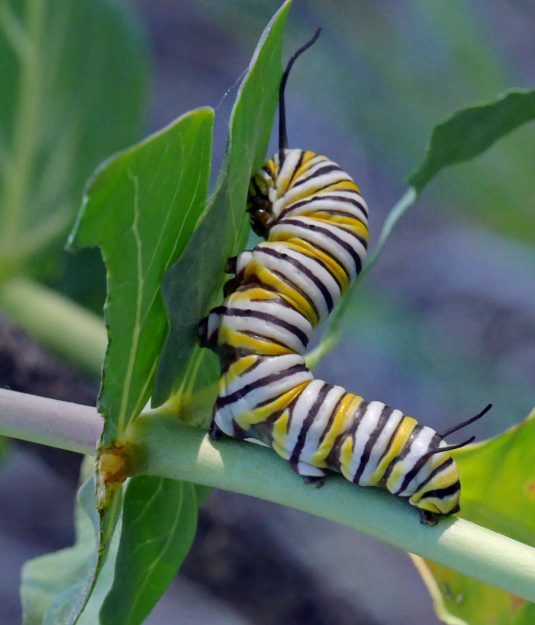 We set about examing all the milkweed plants along the road for caterpillars. Many more were growing up the steep, rocky slope above the road. Since Nancy did not want to tackle the slope, it was already mid-afternoon, and this was just the first scouting trip to the area, I was pretty much content to stay by the road. But a single plant beckoned me so persuasively I had to at least climb partway up the bank. One large mock-orange (Philadelphus lewisii) was in perfect bloom 10′ or so above the road. Even from a distance, butterflies could be seen fluttering all around it, seemingly fighting over who got to enjoy its sweet nectar. I perched above it, trying to stay stable on the rocky slope, waiting with my camera for someone to land, intoxicated by the heady fragrance. I checked out a smaller mock-orange a little farther up the slope, and it also was drawing in a number of eager butterflies. I’m not sure how many species there were, but I was able to photograph swallowtails, checkerspots, a Lorquin’s admiral, a great arctic, a beautiful fritillary with silver spots, and a juniper hairstreak. 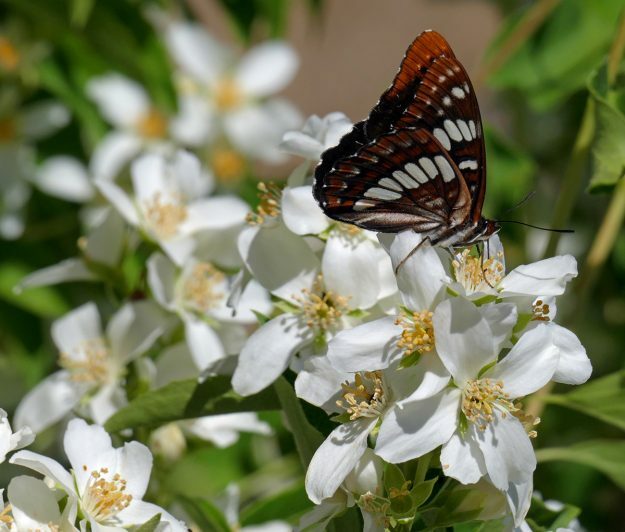 A monarch sailed by numerous times, disappearing for 10 minutes at a time before returning but never landing on the mock-orange. The milkweed had mostly finished blooming, so mountain thistle (Cirsium remotifolium) was the current favorite nectar plant of the monarchs. Like the purple milkweed, cobwebby thistle is mostly found in the Siskiyous. While on the slope, I spotted some blooming (Scutellaria antirrhinoides) and collected spring gold (Lomatium utriculatum) seeds. There were still a few monkeyflowers (Mimulus guttatus) blooming in a seep down the middle, but it must have been much more colorful a month before. The bright blue-violet elegant cluster-lily (Brodiaea elegans) was one of last colorful flowers still in bloom. 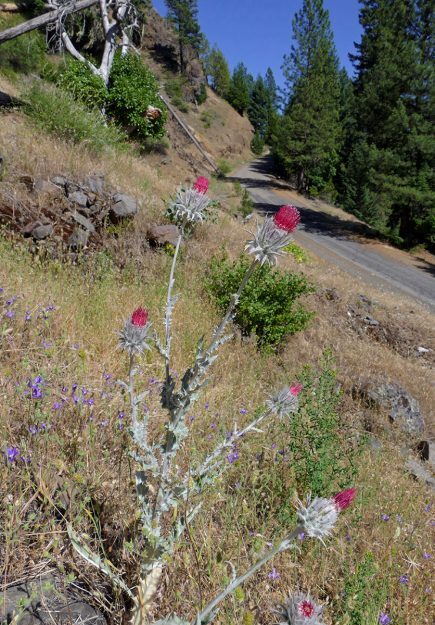 Nancy had spotted some gorgeous cobwebby thistle (Cirsium occidentale) by the road, and I found several more plants blooming up on the slope. Its stunning frosty white foliage and raspberry-colored flowers are unmistakeable. 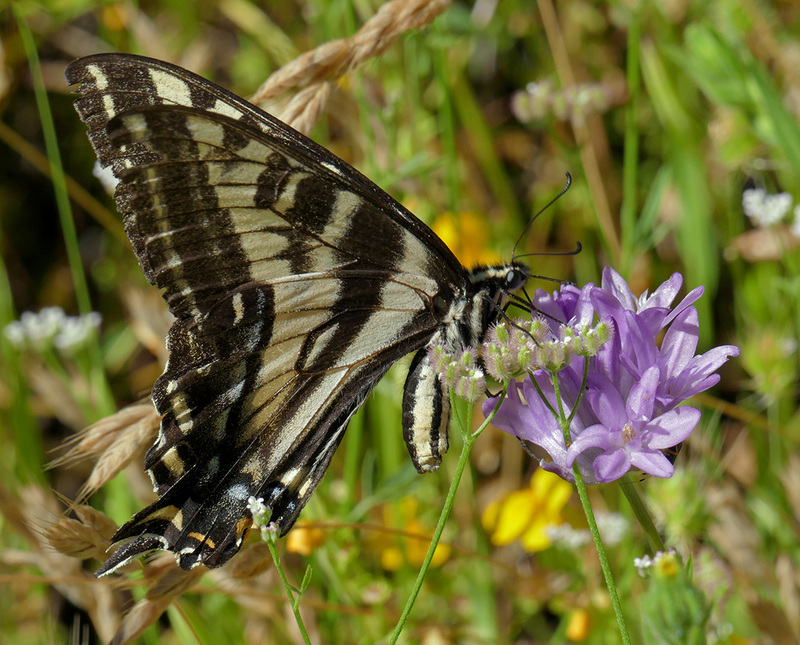 This species is mainly found in the Siskiyous south of Douglas County, but I have seen it in one other site in the Western Cascades, about 10 miles northwest from here just off of Steamboat Road 38. We went all the way down to where we couldn’t find any more milkweed and started heading back up the road. Never having seen more than one monarch at a time, we were excited to suddenly see three chasing each around and briefly landing on conifer branches. We thought we left them behind us as we walked uphill to the car, but there were two more in front of us. Had they slipped around us without us noticing, or were there actually five of them? How anyone can make an accurate count of butterflies, I don’t know. But the monarchs were here and laying eggs on the milkweed, and the caterpillars were growing well. 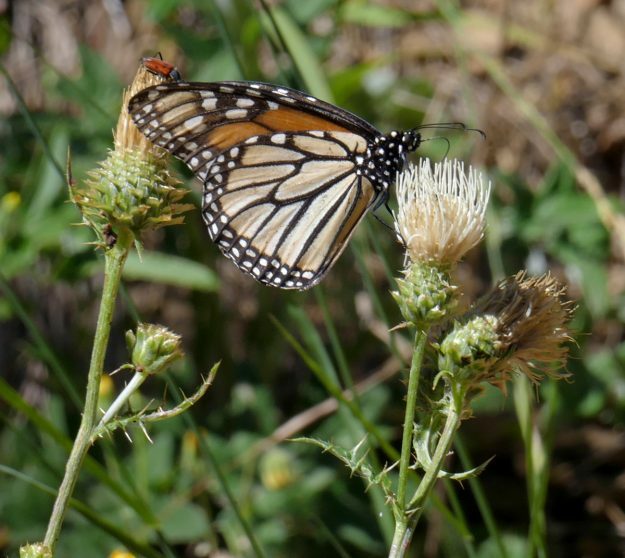 Another great monarch spot in the Western Cascades—how exciting! Love your reports and blogs and photos.